A moment from one of six films included in this year's Reel Minds festival. Young people’s experiences with mental illness are in the spotlight this weekend as the third annual Reel Minds Miami Mental Health Film Festival returns to the University of Miami on Sunday. This year’s festival includes a collection of six short films, along with discussions between mental health providers and advocates. The event is sponsored by the Miami chapter of the National Alliance on Mental Illness (NAMI), which works to educate the public and offers free resources to support people affected by mental illness. Health News Florida: Why have a film festival about mental health? Ares-Romero: We really do want to cure the stigma. Mental illness should not identify who you are as a person. You are many things—you can be a parent, you can be a sister or brother or husband. And so we don't want mental illness, that stigma, to really take over all the things a person can be. And there is recovery. You received hundreds of submissions for this film festival. What stood out about the six films that you ultimately selected? What we wanted to do is really focus on youth and young adults. And so most of these films address that and they really talk about mental illness. We're going to be addressing suicide, social media addiction, we're going to be talking about Alzheimer's disease. We're also going be talking about depression and anxiety. One of the films is a really harrowing short about opioid use. It starts with the main character as a child, and over the course of four minutes, you watch him slide into heroin use. You work with people who struggle with heroin. When you watched that film, what was it that you personally saw? How did it resonate with you? How somebody’s life can just slip through their hands. [Opioids have] the ability of completely sequestering your brain. And those things that were important to you and that you really believed in—you know that the young man in this film is a runner, he's in high school and he's running and he's on a team—those things don't matter anymore. Because now your obsession, the only thing you care about, is: how am I going to get that drug? This is the reality. I truly believe that no one wakes up one day and says, “I'm going to be an addict today.” But this is the reality, what we're seeing day in and day out. And I should say here that there are films that have more upbeat endings, too. 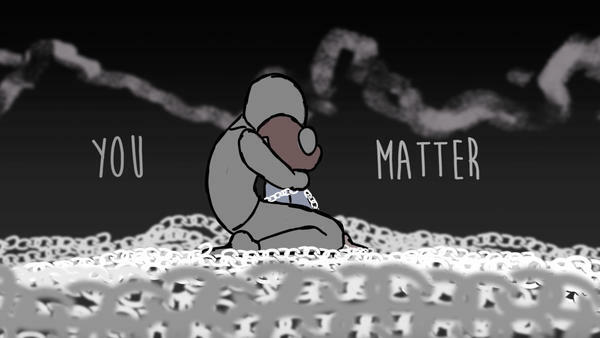 There's a lovely wordless animation about anxiety and depression, and you follow this character as she finds herself and really begins to heal. What does that tell us about the experience of mental illness? The good news here is there is recovery. There's recovery for addiction and there's recovery for mental illness and you can lead a normal life. What do you hope audiences get out of this film festival? We want the audiences to know that mental illness exists and there's treatment. And to be able to identify it and not really stigmatize—“well, they're sick”—because it can happen to anyone. And secondly, we want to get the word out there about NAMI, and what we do, and the wonderful programs that we have that are free for anyone that reaches out to us. You talk about the role of this film festival and helping reduce stigma. What is the danger of stigma? The most significant danger is the fact that people don't get help because they don't want to be identified as mentally ill. So if I'm if I'm suffering in secret, I'm to stay in secret because once I tell somebody that I'm sick, they're going to look at me in a different way. I'm going to be that person that nobody wants to be around. So once it's accepted by the community, it's much easier for people to get help and to get well. It's all about getting well and being recovered. The Reel Minds Miami Mental Health Film Festival takes place Sunday, May 20 at 6:30 at the University of Miami’s Shalala Student Center. You can find information about reserving free tickets here.